Description: Earth Keepers Market is the place to pick your stock of local, seasonal & organic fruits & veges, organic groceries & spices, vegan delicacies, seeds & saplings, organic millets & grains, cold pressed cooking oils, herbal health supplements, healing herbal teas, health products, acupressure gadgets, vision improvement kits, natural body soaps, shampoos, bath salts, non-toxic cleaning agents, tasty and healthy food, personal products, and other natural & eco-friendly products for your everyday use at home. 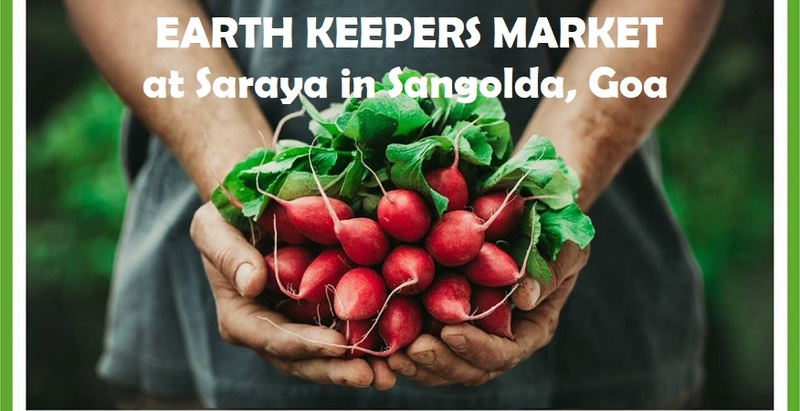 This is a market set up by members of Earth Keepers Goa and Saraya Artspace & Eco Resort, to build community awareness & togetherness through an exchange of knowledge & ideas about an organic way of life that promotes personal wellness and wellness in society. The larger emphasis is to heal our environment and Mother Earth. Besides this we will also have the Keva range of herbal healing supplements, The Lotus Tales range of healing soaps & oils & bath salts, the acupressure range of healing products, seeds to make your vegetable garden, non toxic cleaning products from Welfare of Animals in Goa, non toxic incense sticks, tasty snacks & drinks, natural products, recycled products and lots more! For details of the event or directions to the venue, please call 8888409687.